1. What is dry eye? Dry eye syndrome is a common condition clinically described as the decline in the quantity or quality of tears on the surface of the eye. In some cases it is the result of a decrease in the sensitivity of the cornea, excessive evaporation of tears, or a physical disorder in the glands that form tears. Environmental factors or medical conditions often exacerbate dryness, which can be easily relieved with drops to supplement natural tear production. Every time you blink, you naturally replenish the thin layer of tears covering your eyes. As we grow older, this film tends to evaporate faster, resulting in dehydrated areas on the cornea. Patients of LASIK or other types of vision surgery also might find their eyes drying more quickly. Common environmental conditions and physical or medical factors also affect our sight. Heaters and air conditioning can dry the air and cause eye irritation. Medical conditions, such as diabetes or other immune system deficiencies, have a tendency to reduce tear production. 2. What do we know about tears? We know an enormous amount about tears and we are learning more every day. Although it is a bit of a simplification, the tear film can be considered to consist of three layers. The most superficial layer is the oil layer (lipid layer) produced by the oil glands in the lids. These oil glands are called meibomian glands. This oil layer coats the tear film retarding evaporation like a biological Saran Wrap. The middle layer is the aqueous layer. Scientists used to believe that the purpose of this layer was to wash away debris, but we now know it performs a much more important function. It turns out that the living cells on the surface of the eye have no blood supply. Instead these cells are dependent upon the aqueous "tear supply" for two requirements necessary for life: oxygen and a special mixture and balance of electrolytes. The base layer or foundation of the tear film is the mucous layer (Mucin layer), and this layer provides the natural lubrication for the eye surface. This layer is produced by "goblet cells"--specialized cells on the eye surface that produce and secrete mucus. 3. Can dry eye syndrome come and go? Dry eye syndrome does not truly come and go, but in the early stages of the condition, or with mild dry eye, you may only have symptoms after long days, or with environmental conditions that decrease your blink rate (i.e. computer use) or under conditions that increase evaporation from your tear film (i.e. wind, dry air, etc.). Some patients may notice discomfort only when they wear their contact lenses. Some people may develop symptoms only when they are dehydrated--just like your mouth becomes dry, your eyes can become dry in this way. 4. What causes dry eye? Dry eyes occur when the system that produces your tears breaks down. This causes the clear tissue that covers the opening of your eye (cornea), or parts of it, to dry out. Some people don't produce enough tears to keep their eyes comfortably lubricated. This may be due to aging, medications, menopause, autoimmune disorders, chemical burns or eyelid deformities. Other people produce a normal amount of tears, but the composition of the tears is of poor quality. This means the tears lack certain components, such as oil, that are essential for lubrication. Sjogren's syndrome -- includes dry eyes, mouth, and mucus membranes, and often rheumatoid arthritis or other joint disorder. 5. What are the symptoms of dry eye? 6. Who gets Dry Eye Symptoms and Why? People living in dry, dusty, or windy climates report dry eye symptoms, especially in winter when indoor air is dry and stale. 7. Is dry eye affected by dust, pollen, or tobacco smoke? When tear production decreases, dust and pollen stay in the eye longer and are more likely to stimulate an allergic response. In addition, anything that makes an eye more irritated, including dry eye, will make an eye more sensitive to environmental irritants such as tobacco smoke. 8. If dry eye is not treated will it cause loss of sight? If untreated, Dry eye can progress to a more irritable, troublesome condition called chronic conjunctivitis. It can cause considerable trouble, but is unlikely to lead to loss of sight in most cases. 9. Can excessive reading and TV or computer viewing cause dry eye ...? During reading and TV or computer viewing, the rate of eyelids blinking reduces significantly. This causes the tear film to evaporate leading to dryness of the eyes. This may happen in some people, especially more when they are tired, or have spent long hours watching TV or computers. Use of artificial tears all that time will help soothe the eyes and relieve it of symptoms. 10. How often should I use medications for Dry eye? The frequency of dry eye medications or tear substitutes is usually dependant on the severity of your condition. For mild cases, one or 2 drops a day may suffice, for severe cases even hourly instillation may be needed. Your doctor will generally decide the timing of your tear substitute; e.g., you may need them just after a journey in the dust or after watching TV or Computer for a long time etc. 11. What simple steps can be adopted for dry eyes? Try artificial tears, available as either drops or ointment. Ointments last longer, but are thicker and can cause blurry vision. Don't smoke. Avoid second-hand smoke, direct wind, and air conditioning. Purposefully blink more often. Rest your eyes. 12. What treatment is available for dry eyes? Dry eye syndrome is an ongoing condition that can be cured or not depending on the causes for the dry eye. However the effects of dryness, scratching and burning can be managed. Applying artificial tears and ointments typically treats dry eyes. These give temporary relief, but usually do not arrest or reverse damage to the eye. If the dry eye is caused by environmental factors, use of sunglasses during outdoors can reduce exposure to sun, wind, and dust. Indoors, an air cleaner can filter out dust and other particles from the air, while a humidifier adds moisture to air that's too dry because of air conditioning or heating. 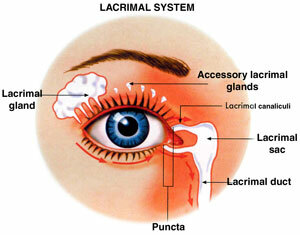 Temporary or permanent silicone plugs in the lacrimal (tear) ducts keep tears in your eye from draining away as quickly. A new type of punctal plug made of acrylic is a small rod that becomes a soft gel when exposed to your body heat after insertion. It is designed to accommodate to the size of any punctum canal. Advantages of this type of plug are that one size fits all so measurement is unnecessary, and nothing protrudes from the tear duct that could potentially cause irritation. Sometimes, however, the tear ducts need to be closed surgically. Dry eye caused by "meibomitis" (the infection and inflammation of oil glands in the eyelids) can be treated with antibiotics such as tetracycline. Contact lens may also be a cause of dry eyes, which can be cured by switching off to a different lens or wearing time of the lens should be minimized with the advice of the eye care practitioner. In a few cases, it is recommended that contact lens wear be discontinued altogether until the dry eye problem is cleared up. If medications are the cause of dry eyes, discontinuing the drug generally resolves the problem. But in this case, the benefits of the drug must be weighed against the side effect of dry eyes. Sometimes switching to a different type of medication alleviates the dry eye symptoms while keeping the needed treatment. In any case, never switch or discontinue the medications without the consultation of the eye care practitioner. Sometimes recommend special nutritional supplements for dry eyes. Studies have found that supplements containing certain essential fatty acids (Linoleic and Gamma-Linolenic) can decrease dry eye symptoms. 13. Can I still wear contact lenses if I have dry eyes? Yes. There are contact lenses specifically designed for dry eyes. You also want to use rewetting drops frequently, and even more so when reading or using the computer. It is also extremely important to follow the proper wearing schedule for your contact lenses. Make sure you use rewetting drops before removing your contact lenses. You can easily give yourself a painful corneal abrasion trying to remove a contact lens from a dry eye. 14. What are the other problems that affect dry eye sufferers? 15. Is it necessary to take nutritional supplementation? Poor nutrition and hormone imbalances are probably the major culprits in causing dry eyes. Lack of essential fatty acids, vitamins A, C, riboflavin and B6 affect the working of the eye's lubrication system. 16. Are any diseases associated with Dry Eye Syndrome? Yes, Rheumatoid Arthritis, Diabetes, Asthma, Thyroid Disease, Lupus and possibly Glaucoma may all be associated. Taking of HydroEyes may reduce some of the inflammation caused by rheumatoid arthritis.